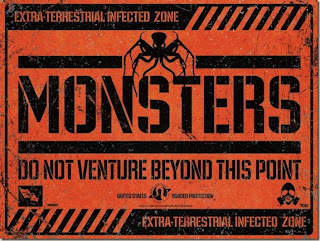 There's been a lot of buzz recently about an amazing new indie monster movie called... well, Monsters. The filmmaker, Gareth Edwards took two actors, two crew, a Sony EX3 HD camera and a whole lotta ingenuity to Mexico and Central America and shot a feature film for about $15,000 (if you believe the hype, that is). We'll never really know what the true budget was, but suffice it to say, the dude made a great looking monster movie entirely out of the studio system. He also did all the the effects shots. By himself. On a PC. Now, it helps that he happens to be a professional digital effects artist, so don't expect that you're going to buy Maya and After Effects and be able to replicate what he did on your own. But nonetheless, this homegrown movie looks almost as good as the big boys. Most of the fx shots are not even the obvious monster shots, but ones that take advantage of compositing elements in post-production that would normally have to be bought or rented for large sums of cash during production - things like signage, planes, tanks, and destroyed buildings. 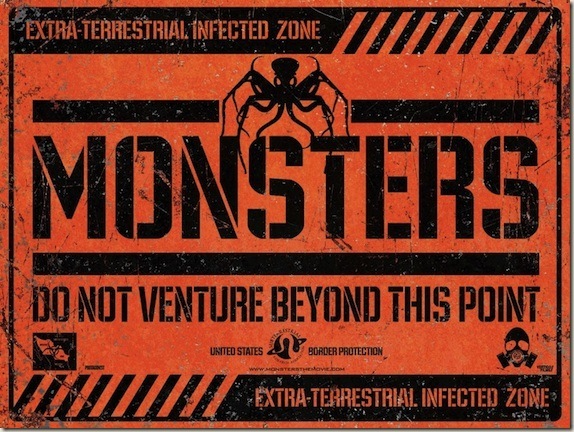 As for the story itself, Monsters takes place in a post-alien infected world where a large chunk of Mexico has been quarantined while the military does battle with the creatures. The story follows two people as they try to get across the "Infected Zone" of Mexico, back to the good ol' USA. It's a simple road movie, with the occasional monster thrown in. 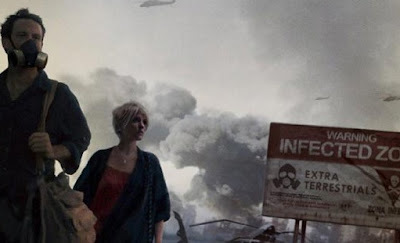 At it's best, Monsters reminds me of elements of Cloverfield , Children of Men , District 9 and Jurassic Park . Its cinema verite feel lulls us into a sense of psuedo-reality which makes the occasional monster interactions that much more intense. The movie's unavoidable political undertones regarding immigration and the U.S. military add a nice touch of depth without overtaking the plot. The film this movie really wants to be however, is Before Sunrise - two unlikely people forced to spend time together while they wait around, banter and take in the scenery. Now that's not necessarily a bad thing, except that in Monsters... well, the dang thing is called Monsters and there really isn't much of them in this movie. The story only really gets going when they finally enter the "Infected Zone", and honestly it should have just started there and developed their relationship as they went along. The other issue is that the characters are just not very interesting, and their performances are just kinda flat for the most part. For an intimate road movie like this, the audience needs to fall in love with the characters as they inevitably do each other. If you watch interviews with Gareth, you will discover that much of the scenes were shot in an ad hoc improvised method, and unfortunately, it shows. And please don't get me started on the character design of the monsters themselves (an issue I also had with Cloverfield) - I had hoped to see something a little more original than giant walking octopi. I really wanted to love this movie - but in the end it's a near-miss for me. I think I like the idea of it more than the actual finished movie. Overall, I'd say that Monsters represents a great example of the new leverage of digital indie filmmaking - being able to do so much with so little. The movie is very well-made, with a great idea and some very cool scenes. I loved the verite approach and the attention to detail. I just wish Gareth Edwards had spent a bit more time in the script writing phase to develop his characters and allow his story to live up to his amazing technical achievements. Monsters is available now on Comcast OnDemand, and also iTunes. It will be in limited release in theaters starting Oct 29. Check it out, but just be aware that you won't be in for 90 minutes of monster mayhem. This is a quiet, reflective movie that gets under your skin and answers the question, do giant alien octopi have feelings too? It's amazing how much a single individual can do. This reminds me of the critically acclaimed anime Voices of a Distant Star, which was done by one person on his computer. If you're looking for a reputable contextual advertising network, I recommend that you take a peek at ExoClick.